Vancouver, British Columbia, is easily one of the most beautiful cities in North America. Perched on the edge of land, wherever you look you will spot gorgeous views of ocean and the mountains that surround the city. 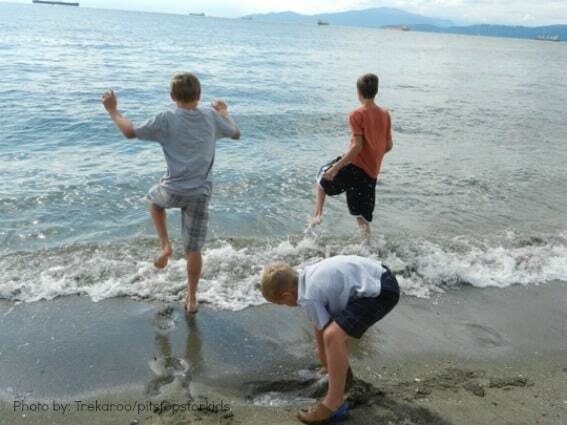 Here are the top 10 things to do in Vancouver, British Columbia selected by Trekaroo’s families. Canada Place is a fun waterfront destination to visit with the family. In season, cruise ships dock here providing a chance to see the boats up close, and the area also provides a great place to watch float planes take off and land in the harbor. Don’t miss the chance to learn more about Canada at Canada Place’s Canadian Trail. This path on the west promenade is divided up to represent Canada’s provinces and territories, so you can walk all the way “across Canada” in just a short distance! And Canada Place is home to ice cream shops and the famous JapaDog food truck, so be sure to grab a snack while you’re visiting. The new FlyOver Canada ride is also located at Canada Place and is a state-of-the-art way to see all the beauty of Canada. Trekaroo families love this ride! When familes needs a break from all that the city has to offer, heading to Kitsilano Beach to enjoy some time in the sun and sand is a great choice. There are lots of family-friendly things about Kitsilano Beach including a kids playground, a pool, lifeguards, and public washrooms. Restaurants and stores are also located conveniently close by. Bring your towel and your frisbee, and enjoy the views of the mountains in the distance while you relax on the beach! 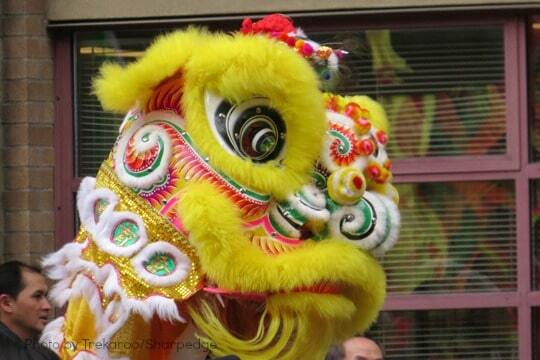 Vancouver’s Chinatown is one of the largest West Coast Chinatowns, second only to San Francisco. Visiting this Chinatown will transport you to another world, full of exotic foods, smells, and sights. In addition to visiting the beautiful Dr. Sun Yet Sen Gardens, Chinatown is a great place to shop for souvenirs or grab a delicious meal. Grouse Mountain is well-known for being a favorite ski area for the people of Vancouver, and it is definitely great for winter fun, but it’s got family-friendly activities in the summer as well! The ride up to the top of the mountain is on the Skyride, a large, enclosed cable car. Gorgeous views of the city, mountains, and water stretch out below as the car climbs up the mountain. At the top, there are trails to explore, nature movies to see, grizzly bears to meet, a zipline, and more. 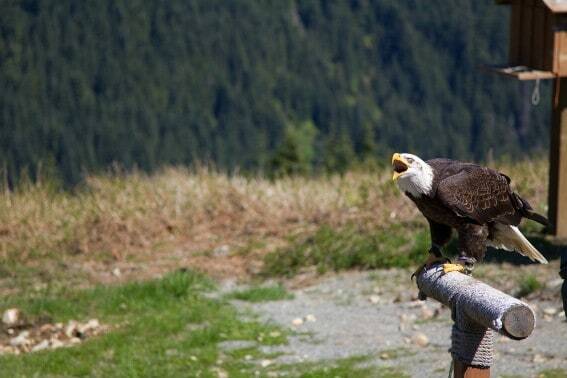 During the summer, a visit to Grouse Mountain might include lumberjack show or hearing a bird specialist talk about local birds. In the winter holiday season, Grouse Mountain is one of Santa’s favorite places to hang out. In addition to meeting Santa, Grouse Mountain is great for ice skating, snowshoeing, and sleigh riding. It’s family-friendly fun, no matter what season you visit! Science World has been a favorite place for families to visit in Vancouver for many years, and it continues to capture the imagination of all of its visitors. There is so much to do and see in this museum. Exhibits range from displays of artwork, to learning about the human body, to figuring out some tricky puzzles! Visiting exhibits change often, so there’s always something new to see. Science World is also home to a great learning and play area designed especially for kids 1-6 years old. Outdoors you will find an exhibit designed to teach about building healthier communities, equipped with real chickens! Science World also has a OMNIMAX theatre and a central stage with live science shows throughout the day. There’s even a Triple O’s burger joint in the museum for grabbing a snack or lunch. Come for the learning, stay for the fun! 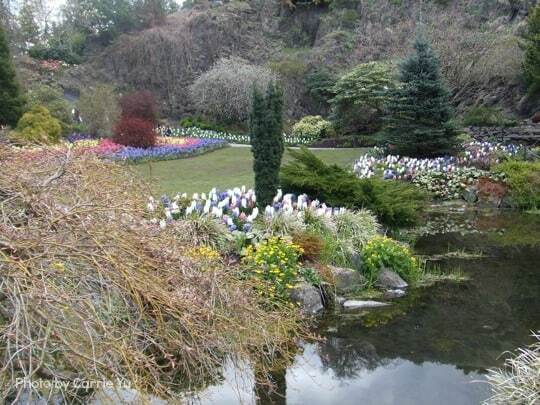 Queen Elizabeth Park is simply a lovely place to visit. Stroll the paths lined with trees and beautiful flowers and enjoy the gorgeous array of sunken gardens. The park is located on the side of a hill above Vancouver and gives visitors expansive views of the city below. There are also lots of patches of grass, perfect for sitting and resting or playing a game of soccer! In the middle of Queen Elizabeth Park is the Bloedel Floral Conservatory. Trekaroo families love that this small conservatory is filled with lots of exotic flowers and birds! It’s a piece of tropical jungle right in Vancouver. Grab a bird guide at the entrance, ask about the kids’ scavenger hunt, and have fun exploring! If you visit Vancouver and don’t make your way to Granville Island to enjoy all it has to offer, you are missing out. Granville Island is a short drive (or Aquabus ride!) from downtown Vancouver and is home to a huge farmers’ market. 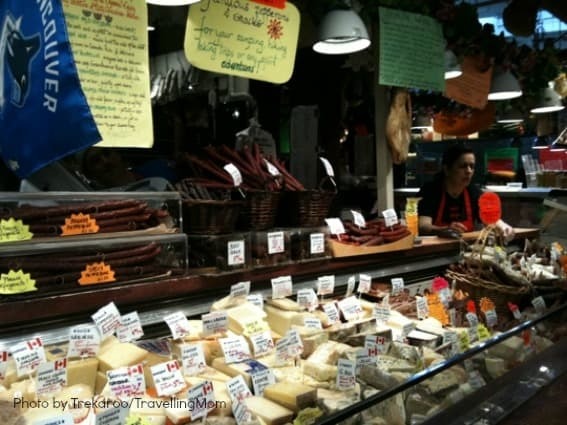 Specialty and local foods stretch out as far as the eye can see. 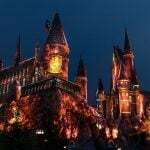 There are also lots of shops where you can pick up unique merchandise, cafes for picking up a cup of coffee, and plenty of places to sit and people-watch! One particular favorite of Trekaroo families is the Granville Island Kids’ Market. The Kids’ Market is located indoors (great for Vancouver’s rainy days!) and has tons of shops selling toys, dress-up clothes, and books, as well as the Adventure Zone, a huge kids’ play area! My family put off visiting the Capilano Suspension Bridge until recently because, honestly, mommy was a little nervous about crossing the bridge. But when we finally visited, it turned out to be such a fun experience! 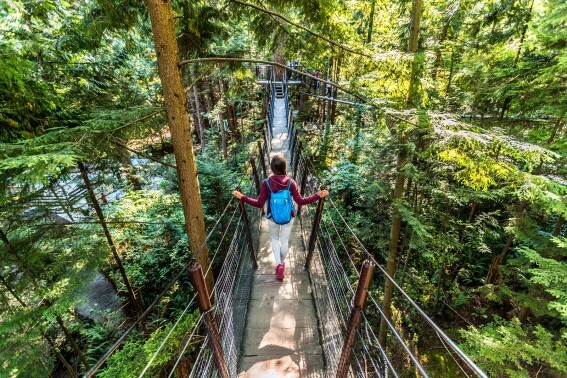 The Capilano Suspension Bridge park is so much more than just the bridge that’s 450 feet long and is suspended 230 feet above a canyon (maybe don’t think about that part until you’re done crossing it…). The park also has a great treetop experience where your family can cross smaller bridges perched up in the trees and enjoy the forest views. For kids, there’s a small scavenger hunt that helps them learn about their surroundings. Another fun and unusual activity is the Cliff Walk, which lets you get up close to the canyon cliffs and learn about the flora of the area. There’s even a glass platform for staring down at the canyon below you! 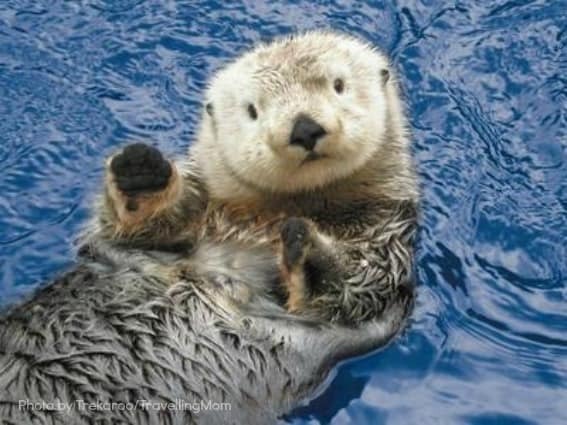 If you have to pick one activity for your family to enjoy in Vancouver, the Vancouver Aquarium is a great choice. This aquarium is enormous and has beautiful displays of local marine animals, a large kids’ play area, and even beluga whale and dolphin shows! All the large marine animals on display are rescue animals, and the Vancouver Aquarium is extremely concerned with conservation and education. On-site there’s also a unique theater which offers 4D movies! 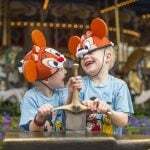 Best of all, all of the fun attractions are included with your admission price. It’s a great place for families to spend a day learning and having fun with marine wildlife. 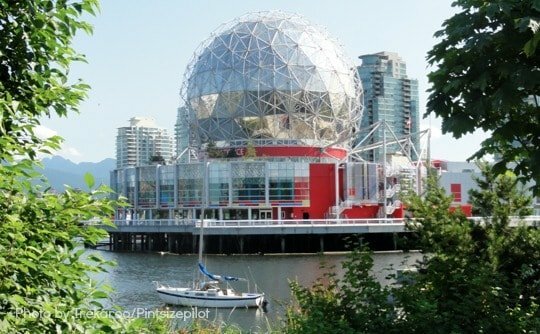 The Vancouver Aquarium is conveniently located in Stanley Park, so it’s close to lots of other fun family activities as well! 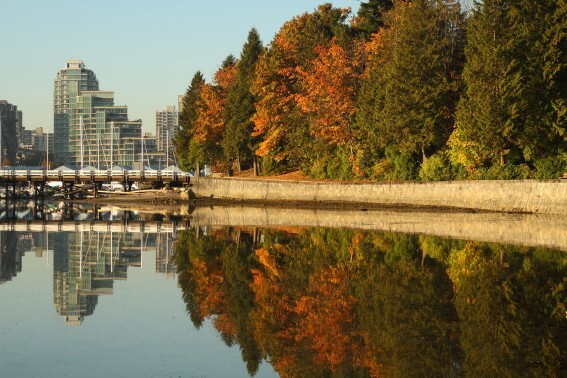 Stanley Park is the first thing that most people think of when they think about Vancouver. 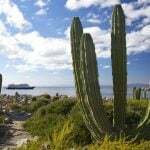 The massive park, containing more than 1,000 acres of fun, runs along the shore of the two bays that surround the city. Activities include riding a miniature train, playing in a splash park, joining a volleyball game or building a sandcastle on the beach, renting bikes and going for a ride, walking along the many trails in the park, admiring beautiful gardens, and more. Families can easily spend an entire day or more exploring all that Stanley Park has to offer. Truthfully, it’s hard to go wrong when it comes to food in Vancouver. The city has so many wonderful restaurants selling all types of food. Thanks to its large Asian population, Vancouver is especially well-known for its sushi and dim sum restaurants. If you’re a donut fan, the Tim Horton’s chain is a favorite! For casual, but still creative dining, check out JapaDog. This unique meal of hot dogs with creative toppings can be found at food trucks in several Vancouver locations. For dessert, don’t miss the award-winning Bella Gelateria and its wonderful gelato. If your family can’t agree on what type of food to eat, head to Granville Island’s food court, which has a large variety of non-chain restaurants of every imaginable type. 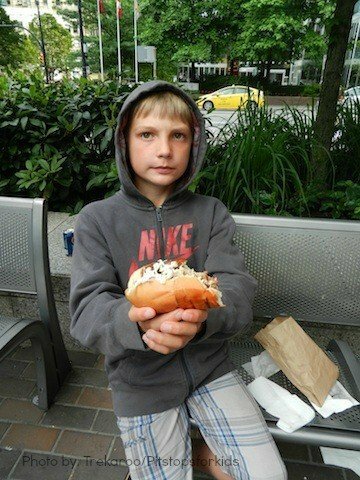 Get more dining ideas from this Kid-Friendly Food Tour of Vancouver! 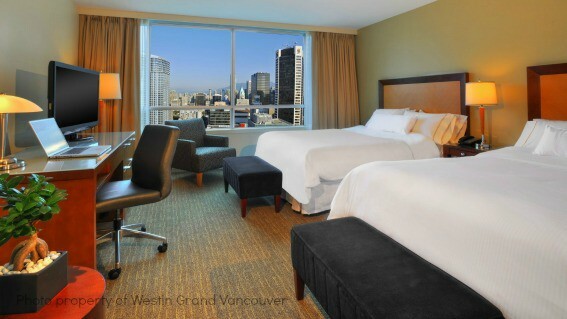 The Westin Grand Vancouver conveniently located in downtown Vancouver has upscale, comfortable, and family-friendly accommodations. Kids will love the on-site swimming pool and adults will love the friendly staff, on-site dining, and well-equipped workout facilities. This is an all-suite hotel and all rooms have a convection microwave oven, cookware, stove, and dishwasher. For a budget-friendly option, try Quality Hotel at False Creek. This hotel has a variety of rooms available including suites with full kitchens. Quality Hotel at False Creek is right in the middle of downtown Vancouver, so your family will have easy access to all Vancouver has to offer. The Georgian Court Hotel is another favorite of Trekaroo families. It has clean, comfortable rooms and is located right near both the SkyTrain and Seabuses, for easy transport to various attractions in Vancouver. Another all-suites option is the Delta Vancouver Suites Hotel which is great when traveling with kids. Your family can choose to stay in either a basic suite or a deluxe suite, many of which have great views of the city skyline. This hotel is very family-friendly with amenities like a “kid essential kit” for kids at check in and individual check-in cards! 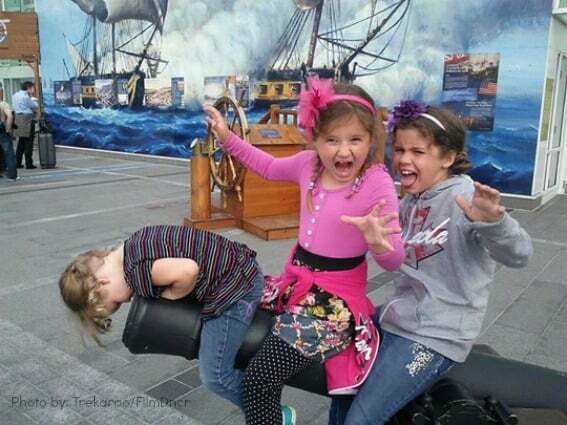 Babysitting is available with 24 hour notice (additional fee). Trekaroo families love that it’s easy access to public transportation from the hotel and that it’s walkable to Canada Place and the waterfront. 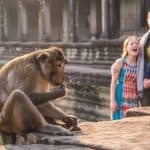 If your family is in need of a change of pace, there are multiple family-friendly day/weekend getaways not far from Vancouver. Whistler, BC is a favorite of Trekaroo families, no matter what the season. 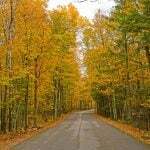 It offers great snow sports in the winter as well as lots of biking, hiking, and other outdoor fun in the summer. Victoria, BC is also an easy trip from Vancouver offering a bit of Great Britain in North America. Visit the Fairmont Empress Hotel for high tea, explore the beautiful Butchart Gardens, learn about local history at the Royal BC Museum, or tour the gorgeous Parliament buildings! Last but not least check out Vancouver Island with kids. Kids can explore a children’s farm, visit the huge Cathedral trees and even learn to surf. For more ideas, read this article about Weekend Getaways from Vancouver, British Columbia! Leave us a comment and let us know what your favorite places to visit are in Vancouver, BC! Thanks for the update, Questa! Sad to hear that!